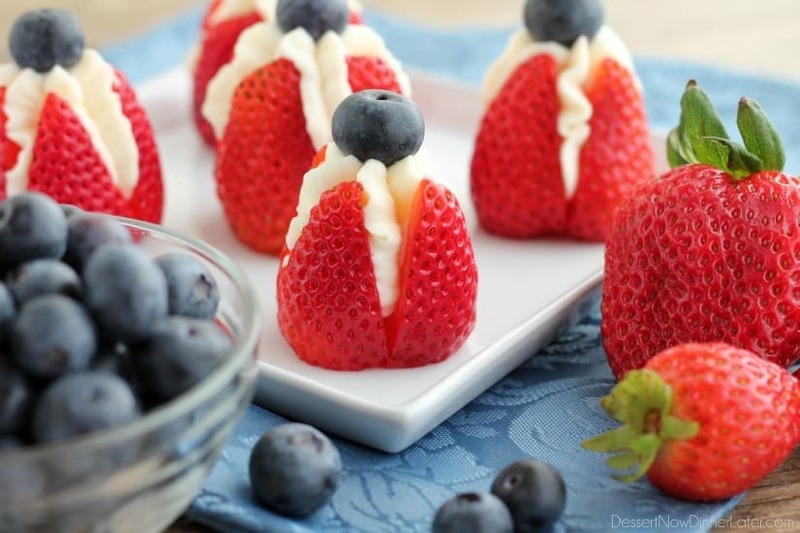 Cheesecake Stuffed Strawberries (+ Video) - Dessert Now, Dinner Later! In case you didn’t know, I will be taking most of June off to spend time with my new baby boy who should be here anytime in the next 2 weeks!!! No worries though! I will have some amazing food blogger friends posting recipes on my blog while I’m away! 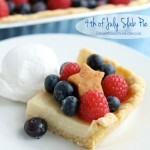 😉 But, since I’m going to miss sharing new recipes with you for one of my favorite holidays, I’ve decided to share another patriotic recipe to help you all gear up for the 4th of July. After all, it’s never too early to plan fun holiday themed food to serve your family and friends! 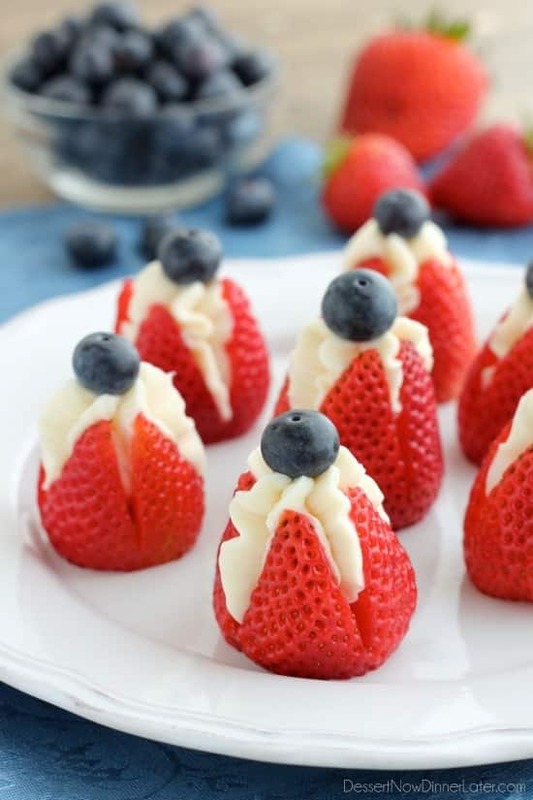 These cheesecake stuffed strawberries couldn’t be easier! I’ve seen so many versions out there. 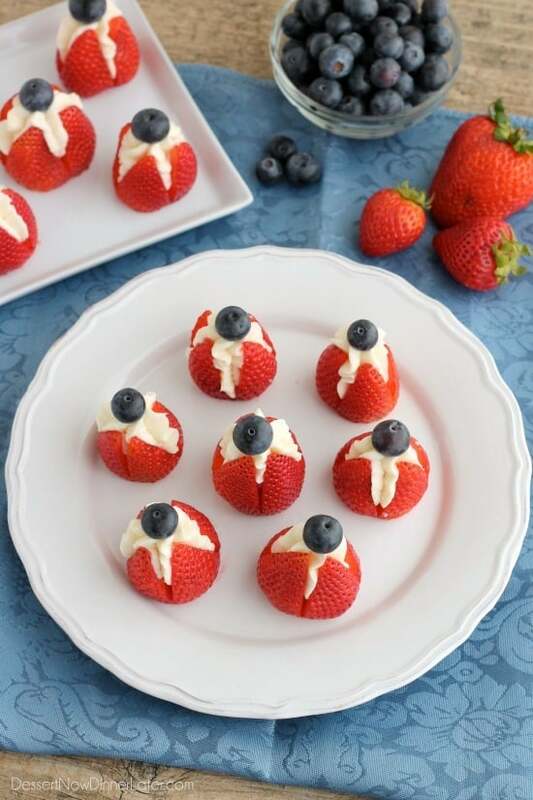 Some of which make you cut off the top and bottom of the strawberry and scoop out the centers. Why would you give yourself more work to do and waste yummy fruit like that?! Not me! Nuh-uh! Simply cut off the stem so you have a flat end, cut an “X” in the tip, and pipe the filling inside. It opens up as you fill it. Don’t go wasting that fruit! 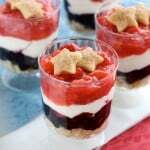 To make these patriotic, instead of sprinkling the tops with crushed graham crackers, we’re topping these with a fresh, plump blueberry. Voila! 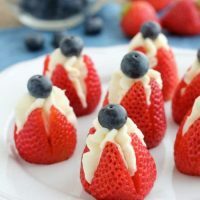 Red, white, and blue cheesecake stuffed strawberries! 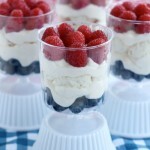 These are a great healthier alternative for your 4th of July dessert and are guaranteed to get gobbled up! Depending on how ripe your berries are, you can prep these ahead of time too. My strawberries were still quite firm, so they lasted a couple days in the refrigerator without leaking juices all over the place and dissolving the cheesecake centers. You should really make these though… they are pretty darn tasty! Great job, they look fantastic! They are way easy too! Thanks! Aaw yay, it’s getting so close. so excited for you and your family! 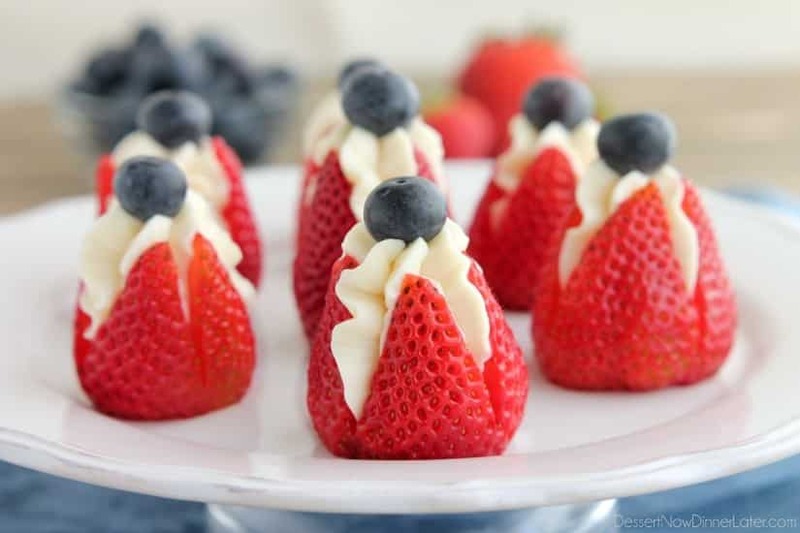 Love these adorable strawberries. Stuffing them with cheesecake is such a delicious idea! The look so cute and festive! Thanks Kelly! So close! I can’t wait! I guess I did fill mine pretty full. Glad you liked them! 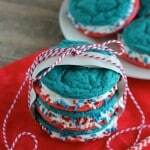 These were a big hit on the 4th – thanks, Amber! Next time I’ll chill the filling before I put it in the strawberries – but that is the only thing I would change. They’re pretty and taste great! They are better chilled. I’ll add that to the recipe. Thanks for your input! These are really nice. I made them the night before the event and the next time I will make them just before because when I took a peek at them the next morning I had juice all over the bottom of the tray. So day of is suggested. Oh man! I’m sorry! Your berries must have been fairly ripe and soft. If they are more firm than ripe, they would have been fine to prep the day before, but yes, making them the day of is definitely preferred. Glad they were still tasty though! Yum! I must try these! Question, should I chill the strawberries with the filling inside, or chill just the strawberries for an hour? Thanks! Hi Anel! I usually fill them and then chill them. Enjoy! Haha! So glad you liked them Betsy! They really do get eaten fast! Hope everyone enjoys them at your party too! Thanks for your comment! Always click over from Pinterest to the blog hosting the recipe. Pinterest’s rich pins, don’t always function properly. Thanks! Will it be an indoor or outdoor event? I would try and put your tray on some ice if it’s outdoors, just to be safe. Its a indoor event. But while i was reading ur msg. Saw a person said, hers was a little soggy when made a day before, So i should have it a little firmer so it wont bled.? I’m so glad! Thanks for your comment Olivia! Try to use firm strawberries. If you can make them earlier the same day, that is preferred, but if you have firm berries that have had time to air dry (or have been spun in a salad spinner) after being washed, you should be okay. As far as transportation goes, I would put them in a deep baking dish (like a 9×13-inch pan) and cover them with plastic wrap. You can put ice packs in the bottom of a re-useable grocery bag and place the dish on top of the ice packs to keep them chilled. Made these for Mother’s Day and they were a huge hit with my family! Everyone loved them! Thank you! I’m so glad Kelly! Thanks for your comment! I made these for a Memorial Day Breakfast/Brunch and so many people loved them! Very easy recipe and elegant presentation! Thanks for this spectacular idea! I’m so glad! Thanks for your comment Julia! These were easy and delicious. But next time I will make twice as many: my son in law filched half of them before I could get them to the table! That’s good, and bad! Haha. Glad they were so liked though! They totally do! So glad you enjoyed them Susan! So fun! Fourth of July hit. I made the day before, storing in tupperware with double layer of paper towels to absorb juices to avoid berry from becoming soggy on the bottom. Gently removed to servinv tray. Worked perfectly. Great thinking! Thanks for sharing! Glad they were a hit! 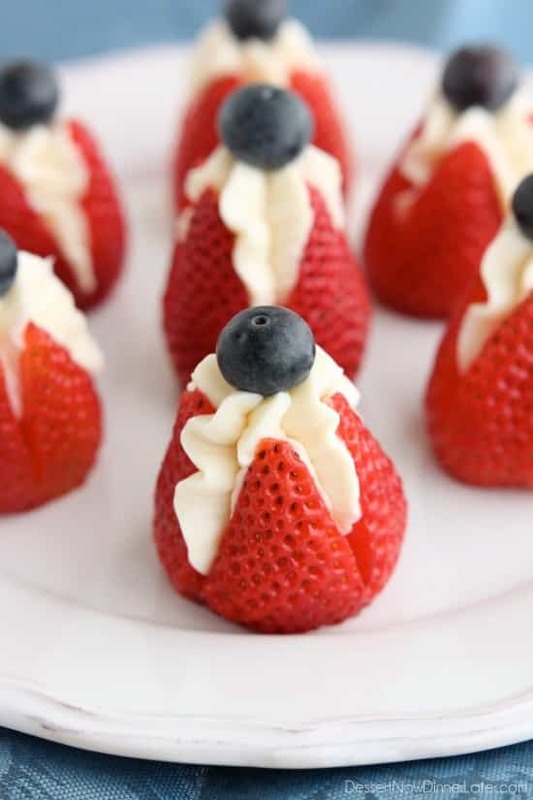 If you used full fat cream cheese, and made 24 strawberries, then they are about 48 calories each.